Braedon Norman allowed just one unearned run in six innings versus Troy. Joe Jackson takes a throw from Braedon Norman as they make a Troy runner retreat. Evan McKinney leads from first after reaching base on a wild pitch on a third strike. He would eventually score on an RBI by Boston Smith. 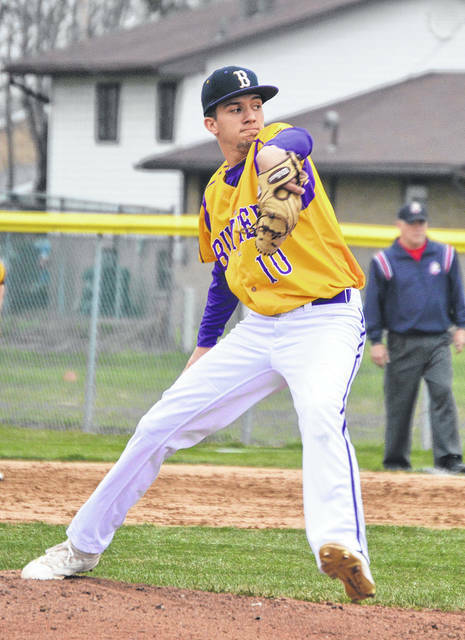 VANDALIA – Butler’s late game woes continued on Thursday as they dropped their second straight extra inning game and fourth overall in a 5-2 loss to Fairborn. The four game skid is the longest of the season and the first time since 2010 the Aviators have dropped four straight. For the third straight game the Aviator offense struggled to score. Butler took a 2-1 lead in the second after a single by Jake DeMoss. An error on the play advanced DeMoss to second. Cam Miller singled on a bunt which moved DeMoss to third and then scored on a fielder’s choice. The Aviators were then held scoreless for the next seven innings. Fairborn plated three in the top of the ninth and the Aviators tried to mount a rally, but with the tying run at the plate and two outs, the game ended on a ground out. The loss drops Butler to 8-8 overall and 5-3 in the GWOC North. 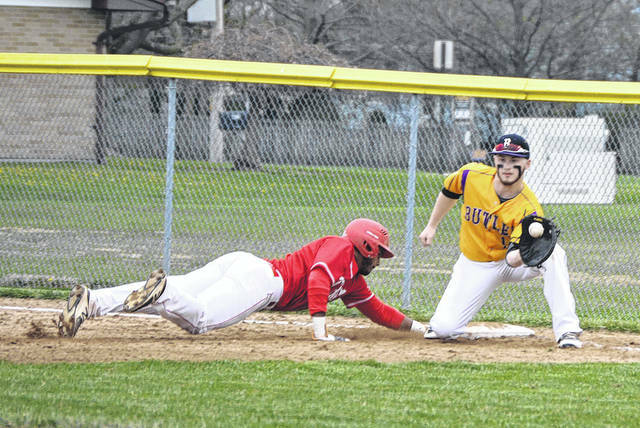 The road to a fourth straight GWOC North Championship is now covered in potholes for the Aviators after being swept by the visiting Troy Trojans in Wednesday’s double header. The Aviators fell short in both games by a score of 3-2, the series finale being decided under the lights in a nine inning heart breaker. In game one the Aviators faced Troy pitcher Derek McDonagh, who held the Aviators in check for most of the night. McDonagh allowed just three hits and struck out eight, en route to a complete game victory. On the flip side for Butler, the Aviators had ace Braedon Norman on the mound who was ultimately saddled with the tough loss. The junior right-hander turned in a solid performance of his own, working six innings with seven strikeouts, four hits allowed and just one earned run. In a pitcher’s duel the margin for error is small, and for Butler the miscues and missed opportunities hurt in a big way. “It comes down to the little things,” said Trent Dues after the game. “They did more little things right then we did. The Trojans played a nearly flawless game, but the Aviators pounced on the sole mistake early. Trailing 1-0 with one out in the bottom of the third, the Aviators put a runner on after a dropped third strike. Evan McKinney stole second base a batter later and it was freshman Boston Smith who would connect on a two out, single line drive to tie the game at 1-1. The game would remain a stalemate until the fifth inning. 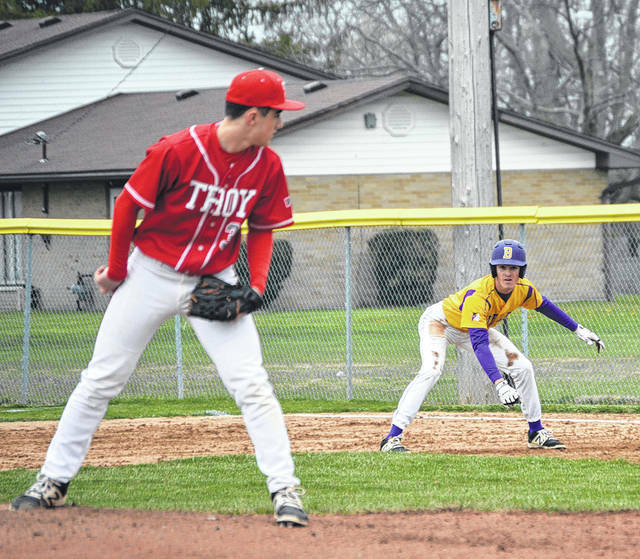 Troy’s Cole Brogan hit a bases loaded, two-out double to left field, to give Troy a 3-1 advantage. The Aviators floundered at the plate as they had for most of the day until the bottom of the seventh. Butler opened the inning with back-to-back walks, setting the table for senior Preston Tofstad. Tofstad laid down a textbook bunt for an RBI single to cut the lead to 3-2. The rally would fall short though, as a ground out and two strikeouts would strand three on the base paths. Unfortunately for Butler, the second game of the evening would bring more of the same. Down 2-0 the Aviators rallied to tie the game at 2-2 in the fifth inning. The Aviators would have runners in position to win the game in the eighth and ninth innings, but could not capitalize. Troy would go on to load the bases in the bottom of the ninth and won the game courtesy of a walk-off single by Matt Bigley. Ryan Wallace of vandaliabutlerbaseball.com contributed to this story.